In this project I tried to investigate the role of painting solely as a decorative object. Patterns can be simply discovered from daily lives and induce aesthetic interpretations without having to borrow words from curators or names from the museums. Can anyone become an artist? What is the difference between creation and production? What is the line between art and those that are not? How are artworks in the restaurants different from those in the museum? These are the questions that I have had for years. I have met numerous people who do or do not (or cannot) like art by working with artists, professors, and colleagues whose lives are dependent on art. Some of them created, or produced a lot of “creative” artworks themselves, but many often faced the audience questioning the meaning behind it, the reason why it was called art. I, too, continued asking these questions through my painting, by investigating the role of decoration in arts where artworks serve as nothing more than adornments for the space. This concept may contradict general reputation of art, as many of us consider decorative arts – such as laces and wallpapers – to be less prestigious than other forms of art. It makes me question why their reputation has been dwarfed – is it because of the technique, mass production? Then what kind of technique would it be the most respectable? There are definitely highs and lows in arts, but where do such standards come from? Does bigger size place greater importance to the work? Or is it just about the institution that presents the work and how the market perceives the artists? In the end, is it all about money and fame? These questions may come across as pessimistic, and my answers to those questions are still vague. However, these patterns do not call for profound questions to enjoy them as we have used these patterns as artistic elements for centuries. These are simply for visual pleasure, something that people want to live in, something that can subtly penetrate into life with its organic presence. 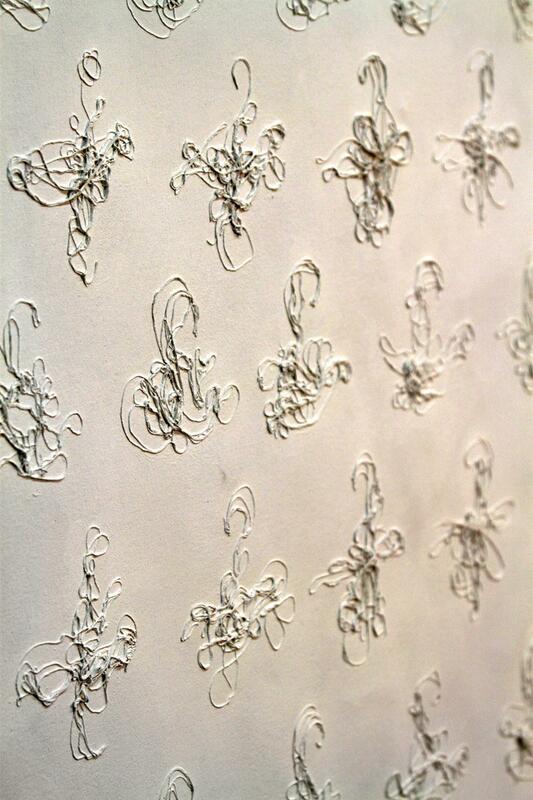 Therefore, Infinity series practice the decorative role of painting where art could solely become the accessorize for the space, with the technique and shapes of laces, the origin of decorative art. Infinity was featured in Student Show at Brown University in 2012 and 2013, and is currently acquired by Brown Arts Collection for display in one of the major buildings in school.